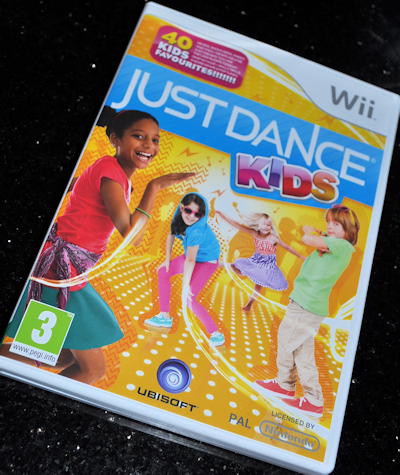 Just Dance Kids by Ubisoft came to us recently through a lovely contact who wanted us to try it out and review the Just Dance for Kids game. And lots lots more. All the songs are at Just Dance Kids on the website. It just goes to show that sometimes, kids are never too old to enjoy something that they’ve been given. Here they are with the Gummy Bear Song. My boys had a lovely afternoon playing all the songs on the disc, and we had an afternoon with friends, and their cousins over who were all younger and were tickled pink to be able to dance about to the tunes. I wish I could have videoed them all when they were doing it, but my boys happily went on before bedtime and I managed to sneak up behind them and get the videos. They really enjoyed going back to some of childrens songs and singing along to the older ones they knew as well as some of the more recent ones. Littlest said it was good fun being a “kid” for the day. When you dance to the tunes, you build up a score that means you can challenge your friends and family to see who gets the blue score and is the winner with the highest score. The screen has a cool icon that means children can skip the song themselves if they want to change the routine, and don’t have to go back into complicated menus to find the next songs. It’s a little touch that pre-school children who don’t yet read will enjoy as they can shuffle through the songs to please themselves and choose from singers like Michael Buble, the Wiggles, Miley Cyrus, Justin Bieber and Selena Gomez. The children here mostly played three at at time – all lined up in a row, and all having an individual score. The game also lets them play against each other in teams to see who comes out on top. It’s a neat feature. My boys are getting older and we have some more games on the way to review, so we have decided that someone else should get the benefit of this disc to have fun with over Christmas. We certainly enjoyed it. If you’d like us to send you our review copy, just leave a comment with a way to contact you – and tell me which song you like best from the playlist and why. The full playlist is on the website – and remember this is a copy that has been opened and used for a whole day. Disclaimer: We were provided a copy of the Just Dance Kids Game for the Wii to write this review. I love this game.This is my one of the most favorite dance game. @mi_shmash come on down, the copy is yours. Everyone else, thank you for entering. It has to be jingle bells, all my sons love that song, its the only one they can all sing, and its his dream to have a Wii… but ssshhhhhh Santa is bringing him one so this would be ideal. The imagination movers are a hit in our house as well. E and I dance and sing along to that one every day. Bud is just starting to do the actions to songs so our he would love to see ‘Heads, Shoulders, Knees and Toes’ on the Wii. Good luck. The kids will pick the winner at the end of the week. My girls would totally love this though. Plenty of songs for them to recognise and a couple for grown ups too…sounds fab! I can just imagine us oldies all grooving..
Julie, I can’t see any way to contact you if you win, so if you are following comments to this reply, could you please leave a comment with a way to get in touch with you.